The Gas Camera System was designed along with The Gas Technology Institute in Chicago for unique keyhole applications, and has been widely used in the gas utility sector for many years. The unique camera design and semi-flexible push rod allow for saddle joint entry of live gas mains at 90 degree angles. Conventionally, systems such as flame ionisation detectors or semiconductor sensors are used for detecting leaks on gas transport facilities. These detection systems locally collect and analyse samples of air that may be mixed with methane. The samples have to be taken directly at the surface of a facility in order to localize any leaks. Detection of small leakages with these tools is time-consuming since the surface of the facility has to be carefully scanned. The procedure is further complicated since even light breezes rapidly move and dilute the gas clouds that originate from the leaks. Additionally parts of the facilities may be difficult to access. The Gas Camera is a remote detection system that provides video images of gas clouds displayed in front of a picture of the target. The system employs an infrared sensitive focal plane array in combination with bandpass filters for detecting gas clouds in air. 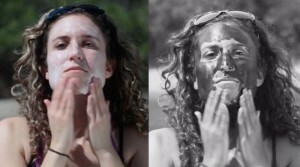 In 2014, filmmaker Tom Leveritt used an ultraviolet camera to show people their skin like they’d never seen it before. Now, you can do the same thing with the Sunscreenr: a tiny, waterproof UV camera that is meant to keep you slathering on sunscreen by showing you when you’ve used enough and where it’s worn off. “With Sunscreenr, we’ve taken powerful imaging technology used by scientists and re-imagined it in a simple device that makes it easy to see if your skin is protected,” explains co-founder Dave Cohen. Like in the viral video we mentioned at the top, areas protected by sunscreen appear black when viewed through the Sunscreenr. And if you need to check your own skin, the colorful camera even comes with a tripod/selfie stick mount. May is actually National Melanoma/Skin Cancer Detection and Prevention Month, so they couldn’t have picked a better month to release a tiny, sunscreen spotting UV camera. The relaunched Optris PI Lightweight 7.5-13 µm series of infrared cameras provides a combination of a re-engineered lightweight mini PC and PI infrared camera. Employing the latest technology, and being the only fully radiometric flight thermography on the market, recordings can be started and stopped via remote control and subsequently edited. The system has a special interface for visual GoPro cameras and USB GPS modules are also now supported, so that geographical coordinates can be embedded in the radiometric video file with each video frame. The total package weighs just 380g making it small and light enough to be mounted on some of the smallest UAV’s available. Infrared images and videos from the air, recorded by drones, UAVs and other flying objects, are becoming increasingly important in industrial maintenance, and significant cost savings can be made using this technology. Applications include building thermography, agricultural surveys, solar farm monitoring, wind turbine maintenance, electricity transmission cable checking and other major infrastructure work. It is also quite possible for the units to be used in security and disaster recovery work such as in earthquake zones, perhaps where collapsed buildings are difficult to access. Covering -20°C to 900°C , the new PI LightWeight can be fitted with our popular high resolution PI400 and PI450 cameras (382 x 288 pixels and a thermal sensitivity of up to 40mK) and for the first time with the PI640 VGA camera (640 x 480 pixels). Video recordings of up to 80 Hz in QVGA resolution and up to 125 Hz in VGA sub-frame mode (640 x 120 pixels) are possible. Depending on your camera, fields of view from 13° to 90° are now available giving you the view of your subject that you need. Paired with the compact but powerful PI NetBox, a mini PC operating under Linux, gives you all the features of our free PI Connect thermal analysis software package. The NetBox has a very low power requirement of just 12W (includes power requirement of camera) and requires a power supply of 10-48V to operate. All hardware is included inside the tiny aluminium housing including Samsung Exynos processor, memory and hard drive. Recording your video files for 35 to 100 minutes (depending on your camera) is a Micro SDHC data card and the NetBox will accept upto 32GB of storage. Downloading of files is simple and straight forward via a USB 3.0 memory stick. The radiometric infrared files copied in the USB stick are opened and viewed in the Optris PIConnect software. If you need a complete drone and infrared camera package, we can put you in touch with system integrators using our PI LightWeight in their UAV and drone aircraft. To install a system to connect the city’s 444 existing corona cameras and allow police to monitor those. In addition, an unknown number of new corona cameras will be added and older cameras will be replaced if needed in the first phase of a plan to update and enhance the Corona Police Department’s ability to use corona cameras to fight crime, department spokeswoman Sgt. Kim Velasco said. The purchase will give officers another tool to do their jobs by giving them “more eyes in the city,” Mayor Karen Spiegel said. “It’s going to help them do their job better and have more ability to catch the bad guys,” she said. The city already has corona cameras operating at City Hall, the library and other city facilities, police stations, cell towers, intersections and at least six parks. But those all operate on independent, closed-circuit systems that police can’t monitor. Corona cameras are expected to be added to more locations, including additional parks, in other phases of the upgrade program, Velasco said.